Cheese graters are an essential item in any kitchen. They can make meal prep a cinch and help you put the perfect finishing touch on any meal. They are also a great last-minute gift for the foodie in your life. What is a cheese grater? 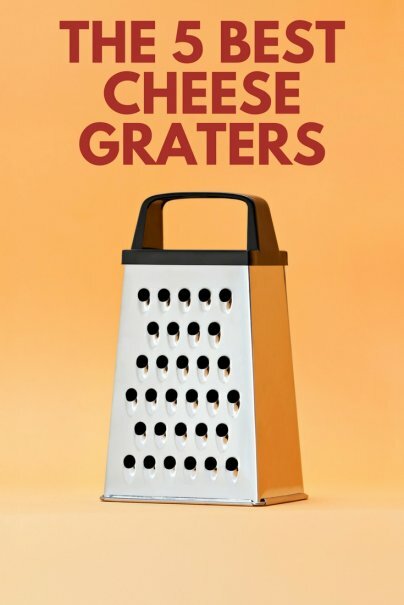 A cheese grater is a kitchen tool that can be used to grate, shred, zest, or slice items like cheese, citrus, chocolate, nuts, garlic, vegetables, nutmeg, and ginger. Each type of grater features different sized grating slots to produce different results. The OXO Good Grips Box Grater does the work of a slicer and three graters in one compact tool. The sharp stainless steel slicing and medium, fine, and coarse grating surfaces can grate everything from soft cheeses to hard vegetables. The soft, comfortable, nonslip handle cushions your grip and makes it easy to use and hold. The nonslip base keeps the sturdy slim box grater steady. The convenient attachable container with measurement markings, nonslip base, and lid can catch, measure, and store freshly grated foods. It can also be stored inside the grater when not in use. This is dishwasher safe for easy cleaning. It is recommended by Consumer Reports, Real Simple, Serious Eats, and Foodal. It is an Amazon best-seller and has outstanding online reviews. The cult classic Microplane Classic Zester/Grater is chosen by professional and home chefs alike. It flawlessly, effortlessly grates and zests citrus, cheeses, fruits, ginger, nutmeg, and small vegetables. It features an ergonomic, soft grip plastic handle and a flat grating surface that is easy to use. The razor-sharp stainless steel grating edges can quickly grate large volumes of cheese. It makes hundreds of fine cuts so zest doesn't stick to the grater. It is dishwasher safe with a hand washable protective cover for easy cleaning. It also has a hole in the handle for hanging. It is sturdy and designed to last through years of consistent usage. This is Good Housekeeping’s top choice for zesting and fine grating. It is also recommended by Consumer Reports, Real Simple, and Foodal. It is an Amazon best-seller and has over 2,000 five-star reviews on Amazon. 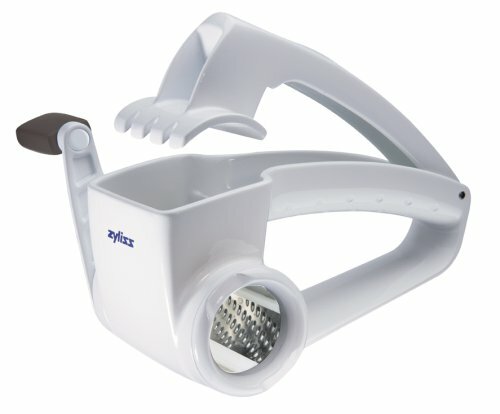 The lightweight ZYLISS Classic Rotary Cheese Grater can be used to finely grate cheese or grind nuts. The sturdy grater works to quickly grate more food in less time. The fine stainless steel drum can grate hard cheese, chocolate, nuts, and more. It features an ergonomic grip and is easier and safer for use because you won’t have to worry about accidentally catching your knuckles. It is dishwasher safe and has removable parts for fast cleanup, and can store compactly in a drawer. This is an Amazon best-seller and has hundreds of five-star reviews on Amazon. It is also backed by a five-year limited warranty. 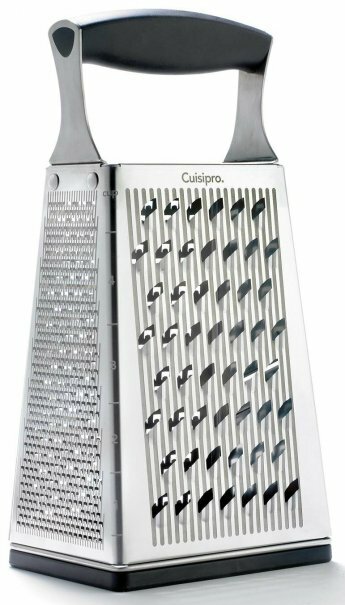 The Cuisipro Surface Glide Technology Four-Sided Boxed Grater can easily handle large quantities of citrus, cheeses, vegetables, ginger, and more. The exclusive Surface Glide Technology offers a repeated grooved pattern that is spread evenly across the face of the grating surface to reduce resistance and grate more with less effort. The ultrasharp stainless steel blades handle any kind of zesting, grating, or shredding job with ease. Food glides through the blades for uninterrupted grating performance. It has a nonslip handle and removable base for stability and an ergonomic handle for a steady grip, comfortable holding, and safe usage. This is recommended by Cook’s Illustrated, The Sweethome, and Foodal. It is also backed by a 25-year warranty. 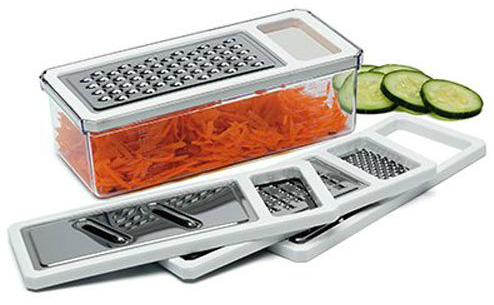 The Prepworks by Progressive Grater Five-Piece Set includes four interchangeable blades and a measuring container with nonskid feet. It features easy-grab handles and sharp stainless steel blades that effortlessly grate, shred, and slice. It is dishwasher safe for easy cleaning. It is backed by outstanding online reviews and is frequently recommended by foodies. And those are our recommendations for the best cheese graters. As always, be sure to check Wise Bread's Buying Calendar to learn when and how to buy just about anything!